Prominent & Leading Manufacturer from Mumbai, we offer screw conveyor. Being a customer oriented firm, we are engaged in offering a quality approved gamut of Screw Conveyor. Keeping in mind the varied needs of our customers, we provide these conveyors in numerous technical specifications to choose from. These are used extensively in sugar, cement, fertilizer, chemicals industries. The offered range is stringently tested on various parameters. 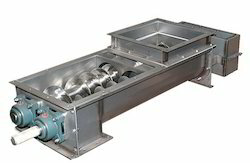 All screw conveyors require that the feed into the inlet be controlled.